Sludge bags or geotextile tubes are gaining in popularity as a way to dewater sludge. 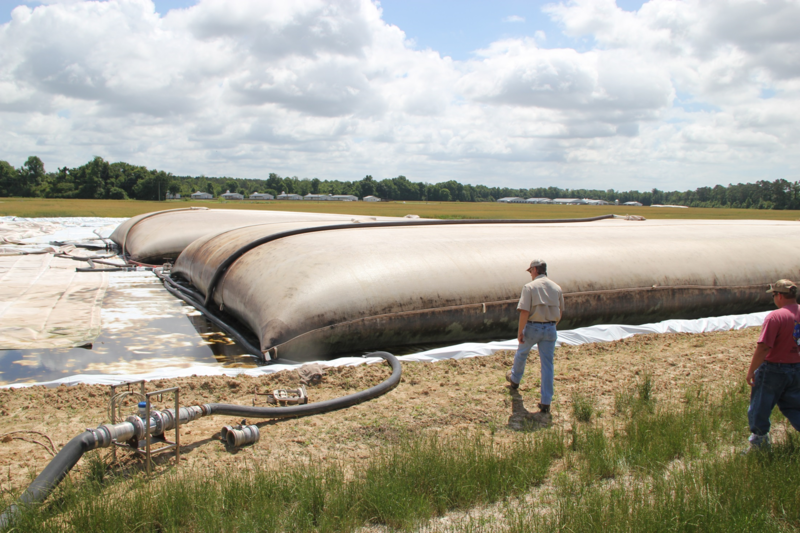 The bags are used as an alternative method to traditional pump and haul to remove sludge in a lagoon. The bags are constructed from high-strength permeable geotextiles. The porous fabric only allows water to escape. The bags are resistant to biological, chemical and UV degradation for 5-7 years. The finished product is easier to transport, can be stored and used later, and has low odor. The bags allow a farmer to target a critical area in the lagoon, such as near the intake. There is the potential for a marketable final product. You will need approval from the Division of Water Resources (DWR) animal division. Price comparison is needed to make sure that this will benefit your farm’s situation. Consider cost of equipment, polymers and distance to receiving land. This article will give a brief overview of the process. Contact your Extension Agent for more information. pumps and piping – system needs to be able to add polymer before the pump, after the pump, and a special pump. Injection point is important. Some lagoons need more mixing, so need a pump to add polymer before mixing. Others need less, so put in polymer after the pump for less turbulence and mixing. frac tank mixes to have a consistent product and helps with polymer dosage rate. polymers and container to mix polymers. There are several polymer types to choose from (examples are aluminum sulfate, ferric sulfate, food grade polymers). The amount of polymer will influence the rate of dewatering and increase the rate and suspension of solids in the bag. Need correct ratio for proper flocculation. 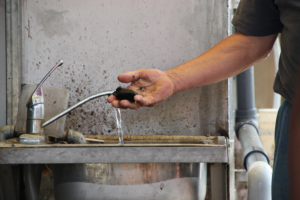 This picture shows checking coagulation or flocculation to monitor polymer dosage. When the water runs clear and the solids stay in a ball means you are at the correct polymer dosage. The picture below shows the bags. Sludge is mixed with polymer and pumped into the bags. Bags dewater and the solids stay in the bags. Bags are pumped full and allowed to dewater. This process continues until bags are completely full. Fill time is dependent on several factors – pump volume, dewater time, polymer effectiveness, etc. Rainfall can affect dewatering, not fill time. Liner will catch water from the bags as it dewaters. Options include silage plastic or other plastics. Slope and grade of the land are critical to ensure that water and storm water are pumped back into the lagoon. Flat or 0 slope going down and in the other direction should be ½ grade slope. Too much slope and bags can roll over because water travels to the low spot. Storm water is a concern. It will collect on the liner and will have to be accounted for and pumped back into the lagoon. Consider how you will pay for removal. Paying on dry matter tons is a fair way because there are different solid percent removal rates. Bags cannot be reused to hold sludge, but can be taken to a landfill or used at construction sites.